We sit around the campfire awaiting the break in the heavy clouds that might allow us a glimpse of the darkening sun, a chance to see this eclipse before the sun settles behind the mountain to our west. You’ve got to have a sense of humor. How else can we make it through this thing called life? And for those of us lacking the ability to crack jokes, may we be lucky enough to have a husband and son willing and able to share theirs freely. A balancing act. What we don’t have ourselves, we learn to enjoy from others. They’ve got their welding helmets on, worn as comfortably as ball caps, only they look more like Tin Men or something sort of medieval and evil. They are ready to look at the blinding sun, if it were bold enough to bust through the clouds. They are confident it will happen. There are two small holes in the cloud covered sky that give us hope. Pin pricks perhaps into the view of the great abyss. But sometimes, that’s all it takes. You gotta have hope. You gotta believe it’s possible. You gotta be ready, just in case. And in the mean while, you might as well have some fun, because what you’re waiting for may never come, but the rest of life isn’t too bad either. Lo and behold. Moments before the sun drops behind the mountain for the evening, one of those pin prick openings in the cloud cover widens, opens just enough to reveal the sun with a big dark circle missing from its fiery face. And then it drops, the clouds continue to open, the sky clears and the evening around the campfire becomes just another beautiful night in paradise. What? No picture of Bob and Forrest in their welding helmets?! I could still see them,though and the surroundings because you,as always, perfectly created it in words for us! Go figure but the photo didn’t come through on the subscriptions. I re-loaded it and it’s up on the site. Bet it’s just like you pictured! Your description (minus the welding helmuts but with husband and son) reminds me of when we were in Tibet some ten years ago, having trekked to the base of of Chomolungma (Mt Everest) after a three day journey to the area, and waiting and waiting for a glimpse of the mountain smothered in clouds. Lo and behold, just before sunset, the clouds parted and … ah!! in all its majesty! Pia, I adored seeing the photo on Facebook… brilliant… thank you! Ya’ll up at ditch camp? I guess not…just saw the pic….ya’ll working up there this summer? Yes! Probably not until mid July. We can’t wait. But plan on enjoying this summer more than ever before in the meanwhile. 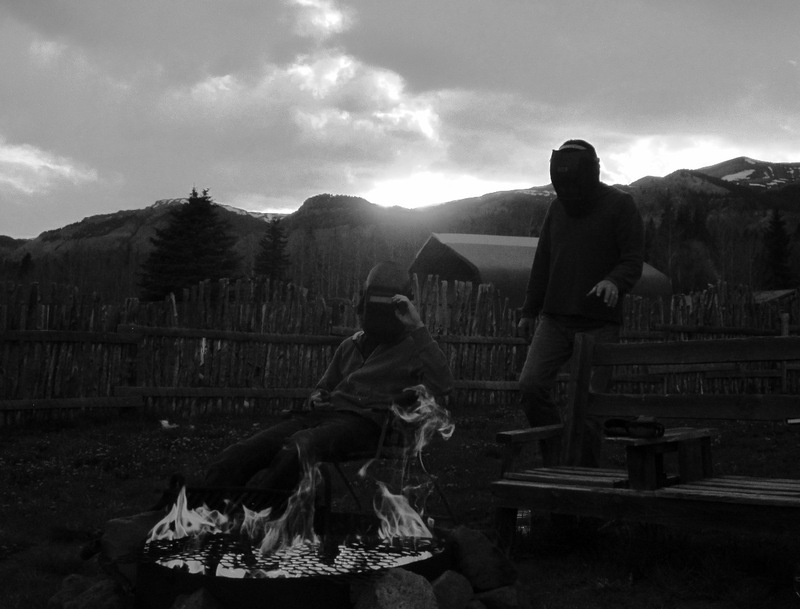 Nothing strange about using welding helmuts .Better than trying to use sun glasses .Spending the evening around the camp fire sounds the best to me .